Much the same here Janey but what a lovely view of your garden beautifully presented. lovely spring pic, and such neat edging! How lovely this looks Janey. Love that clematis. Janey, lovely garden. I'd love a wall, it keeps a garden warm, hence your verbascum flowering. 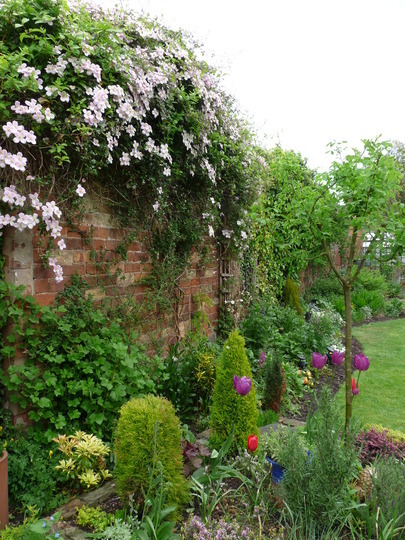 Lovely and fresh looking after the rain, I also love the wall with the clematis growing over it! Fab Montana Janey, it seems to have been a good spring for them, they always look good on an old wall. Walled garden how lucky are you? clematis a picture this year. Lovely. You seem to be the envy of us all with that brick wall.I am not sure about maintaining it though.